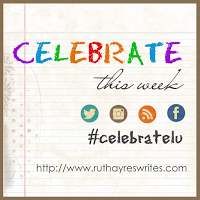 katherine sokolowski: Celebrate This Week - So Much to Celebrate! Celebrate This Week - So Much to Celebrate! I'm grateful, as ever, that Ruth Ayres asks us to pause in Saturdays and share a celebration from the week. Check out Ruth's blog HERE. I was home on Monday from school. I had a doctor's appointment, then Liam got sick. While home, I figured I'd write the two papers I had to do this week for school. The assignments were just posted Monday and wow, they were intensive. Five hours went by (with breaks for lunch and a snack) and both got written - 6,000 words. While it is a lot of work, realizing that I still have this in me is affirming. Getting one back already with great comments and an A+ is even better. Jaleigh Johnson wrote one of my favorite books a few years ago, Mark of the Dragonfly. (If you haven't read it, check out one of my read aloud experiences with it here.) Her new book, Secrets of Solace, is coming out next week. It's a companion book to Dragonfly. I not only love Jaleigh for her amazing stories, but because she happens to be a terrific neighbor of mine. Anytime she is up for coming in to speak to my students, I am thrilled. This week she came in to talk to them about her writing process & inspiration for her books. My students also asked her some crazy random questions, which she answered. Fun things like: her favorite ice cream, favorite books, and favorite spots to travel. We had a blast. In a bizarre turn of events, we had two author "experiences" back to back; Jaleigh visited on Wednesday, we Skyped with Linda Urban on Thursday. It was amazing. Linda knew I had been working on point of view with my students and suggested a Skype to talk to them about it. She did a super cool writing activity with them that I will share next week when they get their blogs written about it. Linda was able to engage them over the computer screen, which is no easy feat. My principal and I were so impressed with their focused writing when she gave them time to have at it. I was on a book award committee for our state this year that's called the Bluestem. It honors books written at any time for 3rd-5th graders. It was eye opening work to see what these book award committees do to create lists. Our list of 20 books for the 2017 award was announced this week. I was thrilled that some author friends made the list. Check it out here. And as for why those classes are worth it...I'm moving up to middle school next year. This is something I've dreamed about for several years, but I thought it was at least five years off. Fortunately, in sharing my dream to move up with administration in my district, I discovered that I needed to get my endorsement now. Our state, in its infinite wisdom, is increasing their requirements for middle school endorsements in 2017. So, I went back to school. When a seventh grade language arts position was posted for next fall, I jumped at the chance to apply for a transfer. I've been in elementary school for twenty years: two years in kindergarten; 1/2 a year in 3rd, 1/2 in 5th; a year teaching second grade pull out in the morning, kindergarten PE & music in the afternoon; ten years in 4th; and the last six in 5th. I am ready for a new challenge and I cannot wait to see what this move brings. Anyone have any advice, send it my way. My biggest challenge of the moment is how to take my classroom library of 3500 books and sort it. Books that are really not for 7th graders will stay, I want to leave the person taking over for me something to start with. But how to even begin? I have no idea. So, it has been a big week. So many big celebrations this week. I've loved it, but am also ready for a quiet week next week. Hope you've had a great one.